Triangle Shirtwaist Factory Fire: The Triangle Shirtwaist Factory Fire brought to light “sweatshop” environments and the lack of worker safety. As a result of the deaths of almost 150 workers, attention was brought to the conditions of some workplaces, especially those employing new immigrants, and labor laws were passed to ensure worker safety. Jacob Riis: A photographer and journalist, Jacob Riis published “How the Other Half Lives” in 1890, documenting the conditions of tenement house living similar to to the way in which Rachel’s family lived. Riis’ book, along with pressure from other reformers, would spur the passage of the New York State Tenement House Act of 1901 which required better ventilation, improved hallway lighting, and indoor toilets. 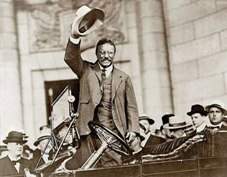 The influence of the book on the future president Theodore Roosevelt would be immense. Watch a short video about the immigrant Jacob Riis. Women’s Suffrage (right to vote): The 19th Amendment giving women the right to vote passed in 1920. Many women of the time, like Bessie, agreed that women should have the right to vote but thought it improper to march in parades or participate in public demonstrations. The opposition to woman suffrage diminished when President Wilson jailed demonstrators who had chained themselves to the White House gates. The outrage from the public and many in Congress over the beatings, unsanitary conditions, and forced feeding in jail prompted Wilson to accept woman suffrage. Carrie Chapman Catt, one of the most famous suffragists, lived in New Rochelle in an elegant Colonial Revival style home on Paine Ave. from 1927 until her death in 1947. Among the first groups who protested at the White House, if not THE first group, was a group protesting the fact that women could not vote. Click here to watch a video about it from the Library of Congress.